Anthony Bourdain is prepared for everything, including waltzing through a minefield. You know, just in case. 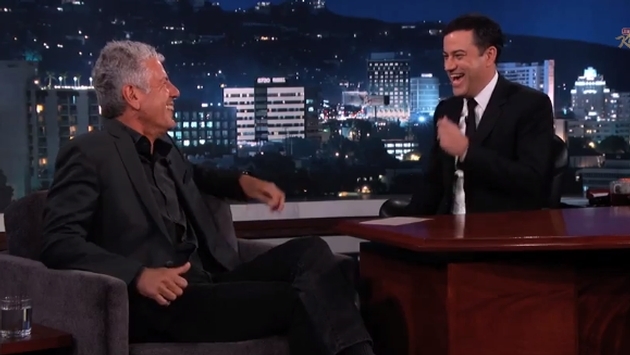 Eater’s Daniela Galarza posted a couple of videos from a recent Bourdain interview on Jimmy Kimmel Live. As you would expect, Bourdain is his usual engaging, humorous self, talking about his Peabody award and what he likes to do with it. Kimmel is asking about Bourdain’s current television venture, just now entering its fourth season on CNN this Sept. 28 at 9 p.m. ET/PT. Kimmel and Bourdain continued; discussing the many ways the 58-year-old chef, author and TV host is prepared for such exotic travels. Now if you have seen any number of Bourdain shows, you will agree he is the one television personality who might need a tip or two in extreme training. The man has been everywhere from Beirut to Hillbrow, South Africa and everywhere in between. Up next is an intense “anti-kidnapping” driving course, which he is extremely excited to dive into. This, by the way, would give him all the necessary talent to be the subject in a new Liam Neeson movie. In fact, if there is a world crisis, just send Bourdain. We imagine this arduous training is all in an effort to become this country’s version of James Bond—a title we are willing to give him now.